Standard PSAa have to be relatively "flowable" otherwise they won't make good contact with everyday surfaces. This fact is captured in the Dahlquist Criterion which states that G' should be < 0.1MPa. Here we use a simple formula to show where this number comes from, given typical rough surfaces. When a PSA is (lightly) pressed against a surface the adhesion would be maximised if it could flow round all the peaks and troughs in the surface to make full, perfect contact. This is not because rough surfaces increase adhesion because of a mythical higher surface area. The extra surface area of a typical "rough" surface is probably <5% higher than the equivalent planar surface. In fact the opposite is true: rough surfaces are a severe problem for PSA. If the (light) pressure gives contact with only the peaks of the surface then adhesion is reduced catastrophically. Here is a rough surface1 where R is the Radius of the typical bumpy feature on the surface and h is the height of that bump above the mean level of the surface which is shown as a horizontal dotted line. An alternative formula from Prof Michele Ciavarella is described below. When the adhesive's modulus G < Gc the adhesive will spontaneously flow (even with the lightest of pressures) into the peaks and troughs and maximum adhesion will be attained. Those who know about JKR experiments in Practical Adhesion will see the analogy with radii, distances, moduli and the attractive power of W.
What this means is that you need a very low modulus, G, for sharp features (R is small) and/or deep features (h is large). Although a high W can help, in practice for most materials W varies over a small range of ~25 to 60 mN/m whereas R can vary by factors of 100. 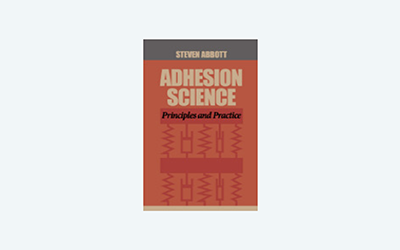 "For measurable quick tack, the elastic modulus must be below a certain fixed value which is fairly independent of the nature of the adhesive, the adherend and the applied pressure." He decided that the "certain fixed value" should be 0.3MPa, which makes sense in terms of the default calculation. Of course, this is only a rule-of-thumb; for any specific application with known W, R and h you can create your own criterion. But 0.3MPa has been a useful rough guide for more than 40 years. There is a surprising variation in the quoted values of the Dahlquist criterion with 0.1MPa being common and other values are clearly wrong such as 106 Pa and even, in some cases, 105Pa which is an unfortunate misprint. Dahlquist’s original statement was 3x106 dyne/cm2 and it is strangely common to see this quoted as 3x106 dyne/cm2 (0.1MPa), even though 3x106 dyne/cm2=0.3MPa. The Dahlquist G is really a G' and you now know never to think about G' without thinking about timescales. For putting a PSA onto a surface the timescales are typically 1s, so the relevant G' for a room temperature PSA at 25°C is ~1Hz, a convenient temperature and timescale for routine G' and G'' measurements in rheometers or DMAs. 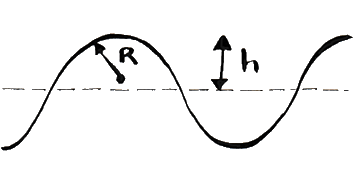 Here λq is the RMS wavelength and Rq is the RMS height of the rough surface. The advantage of the Ciavarella formulation is that both parameters are standard, real-world values found on more advanced surface roughness measurement devices, rather than the idealised values in the original formula. The formula can be derived from Eq.5, 8 and 10 in this paper2. Those who want more detail can find it in this pdf note from Ciavarella & Papangelo. Note, however, that the use of λq in the app is for pragmatic reasons. The precise relationship between this and the λ0 used in the theory is not clear. Clearly there is more to PSA than room temperature, 1Hz applications. Dahlquist is a middle-of-the-road criterion. For a more profound way of thinking about good PSA designs we need the next app - the Chang Window. 1Readers might object that real surfaces don't have a single height and radius of curvature. One of the amazing things about surfaces, demonstrated by the top physicists, is that most of them can be readily approximated by an equivalent height and radius. Note that the Ciavarella approach achieves the same thing using real-world measures. 2M Ciavarella and A Papangelo, A generalized Johnson parameter for pull-off decay in the adhesion of rough surfaces, Physical Mesomechanics, 20, 65-72, 2017.